How Retailers are Changing …. Walmart, Target and Kohl’s recently rolled out mobile checkout capabilities, which give store employees capabilities to check out Customers using mobile devices, an experience similar to Apple stores. 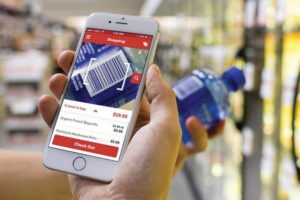 Further, they are rolling out digital way-finding tools to help Customers navigate through aisles to locate items quickly, find them at other store locations, or have them shipped to a Customer’s home. Through convenience enabled by mobile, IoT, and in-store technology, retailers are pivoting away from an old industry mindset – get Customers into stores so they’ll spend more dwell time, and as a result, spend more money. While this model has worked for a very long time, and still applies to people who prefer to browse before buying, the focus is now on making the in-store experience as efficient and personalized as possible. Even if the Customer only spends a few minutes picking up a low-price item, it’s not an issue. The idea now is to build loyalty to a brand that encourages ease of transaction and repeat visits – either online are in the store. “ The historic model of retail is all about having the inventory and having Customers come pick it up ” said eMarketer e-commerce and retail analyst Andrew Lipsman. If you’re engaging in inventory retail, the only way to win is when a Customer needs it at that moment. And as Amazon does more same-day delivery, you’re going to lose. So instead of trying to battle Amazon using the old model — hoping that whatever is in stores will compel Customers to make purchases — retailers are focusing experience driven through convenience. D. notices about related items, in store specials, etc. With this, shorter, smaller-dollar visits aren’t a concern for large retailers who once thrived on keeping a Customer on site as long as possible. They’re changing with more options – If a Customer can send a pair of online-only shoes to a store and pick it up there the same day, that’s a sale the retailer may not have made otherwise. “ It’s about giving Customers options and the ability to select from attractive choices during their visit ” said Walmart rep Ragan Dickens. “ It’s about an omnichannel approach and what works for them in that moment ”. A Customer may have several visits over time or in a single day, and the retailer wants it to an enjoyable experience each time and to meet their needs in the most convenient way for the Customer. Another example of changes in retail is Target recently rolled out employee-assisted mobile checkout. Under a new “ skip the line ” convenience service, employees equipped with mobile devices are deployed to the busiest sections of stores to help Customers settle up without lining up at checkout. With Target already offering Customers curbside and in-store pickup, they are now working to use stores to serve a dual purpose, by catering differently to Customers who need to get in and out in a few minutes, and those who have the time to browse. Extending on this, further plans include consideration for stores with two entrances: an “ Inspiration ” entrance catering to those who want to spend time at the store, plus a ” Convenience ” entrance designed to serve Customers who are in a rush. This is the concept behind Target’s Houston “ next generation ” store, and plans for a redesign of 600 stores going forward. “ Less time at the store is not a concern — our traffic has been increasing ” said Target’s Eddie Baeb. “ The more convenient we can make our stores, the more relevant they are to the Customer lifestyle ”. Instead of focusing exclusively on growing purchase volumes during each individual visit, the new strategy is long-term loyalty, said David Bray, CEO of Briz Media Group, an ad agency that serves tech companies that work with retailers. Tech is making the experience easier and more enjoyable for Customers, triggering a more positive association with the brand. “ The old school philosophy was keeping people in stores as long as possible and have them buy many things (like shoes, makeup, clothes, etc.) – but now with the online offerings, the offline world is about creating the brand relationships with the consumer ” he said.